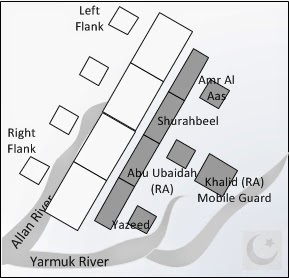 Read part 1 of the Battle of Yarmuk here. Mahan felt the wind sweep across the blood soaked plain as he came out of his tent and slowly mounted his horse. Khalid (RA) was outnumbered by a wide margin, he thought. They must be tiring by now. It was just a matter of time before victory. He decided to keep the same strategy as the previous 2 days: attack the flanks and keep throwing fresh men until the lines broke. Mahan focused on the left flank and gave the order to charge. Just as the previous day, his fighters broke through after several attempts. 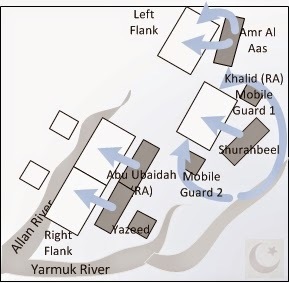 Just as the previous day, the Muslim commanders reorganized and launched a counter attack with Khalid (RA) supporting. And just as the second day the Muslims pushed the Romans back to their lines. Mahan’s face grew dark with concern. His lips tightened at the thought that he had thrown everything he had and gained nothing. From the other side of no man’s land he could hear the cries of “Allahu Akbar” repeated over and over again. Their morale must be high. Mahan’s window of opportunity was closing and the chances of victory were becoming slim. The morning mist from the Yarmuk river gave a strange sense of calm on such a momentous day. It was now or never. Mahan knew that if his men did not break through they would not be able to launch another offensive. Today had to be decisive. Realizing how desperate he was, he knew he had to take advantage of any opening no matter how trivial. His men were ready. The standards were fluttering in the air and Mahan gave the order to charge. The horn sounded and the soldiers broke free. He was leaning on his veterans on the left flank again. So far they had carried the lion’s share of the fight and would do so again today. After three days of fighting Mahan felt the Muslims on his left flank were ripe for the picking. The Roman soldiers engaged Amr and Shurahbeel’s Corps. Amr’s men held their line but the Romans broke through Shurahbeel. At last! thought Mahan. He watched his troops break through. He knew Khalid (RA) would move his mobile guard to support as he did the previous few days and this time he would act decisively. 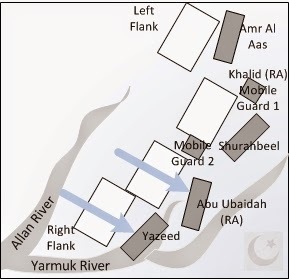 Once Khalid (RA) moved the mobile guard, Mahan would order the other flank to attack. Without support, the Muslims line would crumble before Khalid (RA) had a chance to react. Mahan waited. Khalid (RA) never moved. 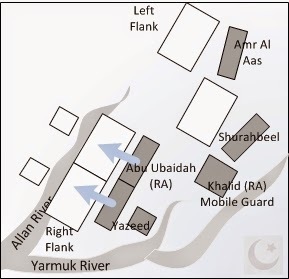 Instead, Khalid (RA) ordered Yazeed and Abu Ubaidah (RA) to charge at Mahan’s right flank to pin them down. Khalid (RA) was always one step ahead of him. Khalid (RA) was reading his mind and hearing his thoughts. Mahan was dealing with a master tactician who read the battlefield like a book. Those were not fairy tales he heard in the capital; they were true stories. Mahan’s brows furrowed in frustration; he couldn’t do anything! 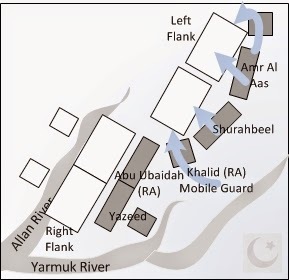 Once his right flank was pinned down, Khalid (RA) divided his mobile guard in two. The first half attacked the Romans by going around Shurahbeel’s army and the second half attacked from the south. It was a brilliant move. Hit from three sides, the Romans were pushed back to their original positions. Out-maneuvered again. Meanwhile, on the banks of the Yarmuk river, only the standards could be seen above the dust cloud that enveloped the fighting men. All that could be heard were the sound of swords clashing against shields, arrows whizzing by, the screams of fallen soldiers and the groans of dying men. 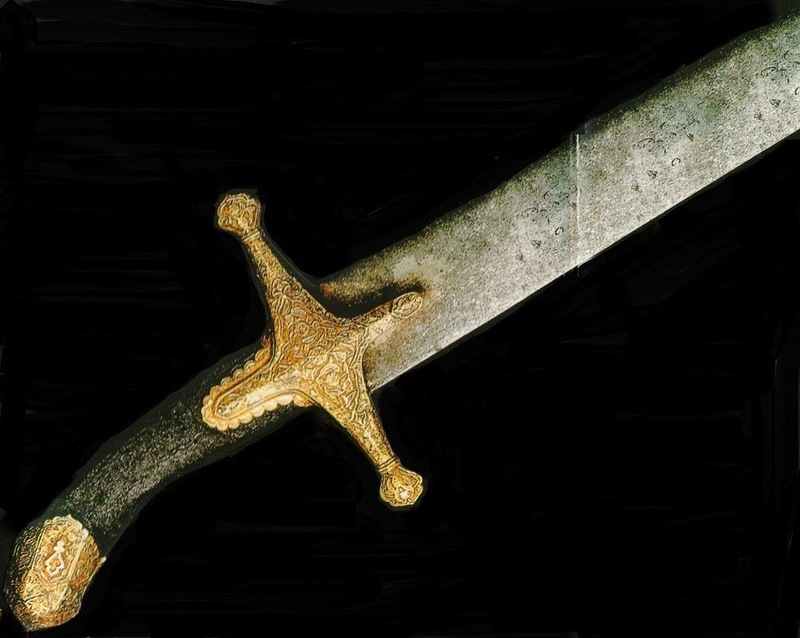 Abu Ubaidah (RA) and Yazeed pinned down the Romans, giving Khalid (RA) valuable time to clean up the situation on the other side; but they had no support. The Roman archers launched an arrow barrage, which covered the blue sky black with arrows sailing across and impaling their victims with deadly accuracy. 700 Muslims lost an eye and the day become known as the day of lost eyes. Both commanders wisely pulled back. Feeling the pressure of this rare opportunity, Mahan pressed his advantage. He ordered the right flank to chase the retreating Muslims. The Romans surged forward. Their morale boosted at the sight of a retreating foe. The Romans jumped over the fallen in pursuit, slashing at anything not Roman. The Muslims fell back deeper into their territory. As the Muslims retreated, one regiment stood its ground. Ikrimah, one of the great foes of the Prophet (SAW) before his conversion, made a pact with death. He would not surrender his position or die defending it. 400 men followed him. 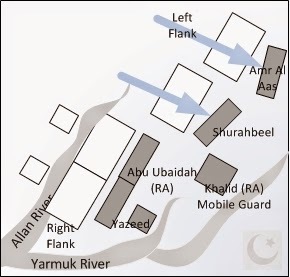 With the Muslim army falling back, they were surrounded on all sides. With the ferocity of possessed men they slashed their swords and thrust their spears against all challengers. The position was never lost. Of the 400 men, everyone was either killed or severely wounded. Ikrimah and his son were mortally wounded. Father and son would later die with their head in the lap of Khalid (RA) – his uncle and dear, dear friend. As the Romans surged deeper into Muslim territory, Mahan looked beyond the mayhem of the battle field and could see the Muslim camp. Tents of all sizes with camels tied down, tended by their servants. The women stood outside staring at the drama unfolding before them. The battle raged for hours. Each side knowing what was at stake. Mahan was anxious. He was looking for a sign, anything to tell him the Romans had broken through. He could see the Roman standards deep inside Muslim territory but they weren’t moving. Several women emerged from the camp and with sword in hand threw themselves against the Romans with wild shouts. The men seeing their women fighting, flew into a rage and counter attacked. The battle on this front broke down. There was no manoeuvre a general could make to sway the outcome. It came down to each individual soldier giving their super human strength to overcome the other. Under the heat of the afternoon sun pounding down on the fighting men, Mahan saw the first sign. The fluttering flag of a Roman standard pulled back. Another several hundred meters away also pulled back. Another fell to the ground out of sight. A trickle of men started to retreat and then it became a flood. Mahan’s chest deflated, his head bowed and his eyes shut. They were so close. The Romans were overcome and retreated back to their lines. As the afternoon turned to evening the day’s action came to an end. It was a vicious day. The battle raged across the entire front and all generals were engaged in combat. Every commander proved his right to be a leader of brave men. After four days of intense fighting and outnumbering the Muslims 3 to 1 the Romans could not deliver the final blow. The morale had shifted in the Muslims’ favour. As the sun set on the western edge of the Yarmuk plain, Mahan walked towards his tent passing workers burying the dead and tending to the wounded. Entering his tent, he flopped on the cushions. After a period of stone cold silence he instructed his deputy to assemble his war council. They had to decide the action for the next day; but he knew the answer. They had to negotiate a truce. But would Khalid (RA) agree?